First Wedding Cake of 2017! 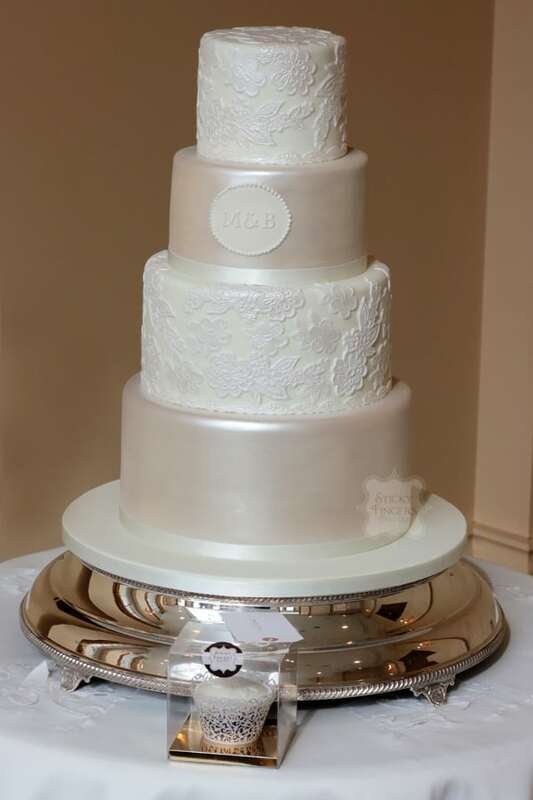 We had the greatest pleasure in delivering our first wedding cake of 2017 to The Lawn, Rochford, Essex on Saturday 11th March for Mazula and Bruce’s special day. They were actually getting married at Mazula’s church near her home in London then everyone was piling on traditional double decker buses and coming along to celebrate. That must’ve been a wonderful sight on the A127! We first met the happy couple at The Lawn’s winter wedding fair in January so time was of the essence; but they were so easy to work with the short time scale wasn’t a problem. They really loved the simplicity of our extremely popular (and very gorgeous!) Bella wedding cake but chose to have a four tier version instead of three. They were having a fresh flower display on the cake too, so the design was perfect for that. They chose to have three tiers of our scrummy White Chocolate and Passion Fruit cake whilst the bottom tier was a “dummy” tier. We also made a wheat and dairy free carrot cake cupcake for one of the guests which was boxed up especially and decorated in the same syle as the wedding cake – nothing’s ever too much trouble here at Sticky Fingers Cake Co HQ! Congratulations to Mazula and Bruce! We hope you have a long and happy life together.